6th or 7th century A.D. Note the repetitive signs, perhaps meant to imitate writing. The "text" is written in a pseudo-script, in lines emanating from the center. The meaning of the design at the center is unclear, but it might be a drawing of a room with demon-bowls at the four corners. 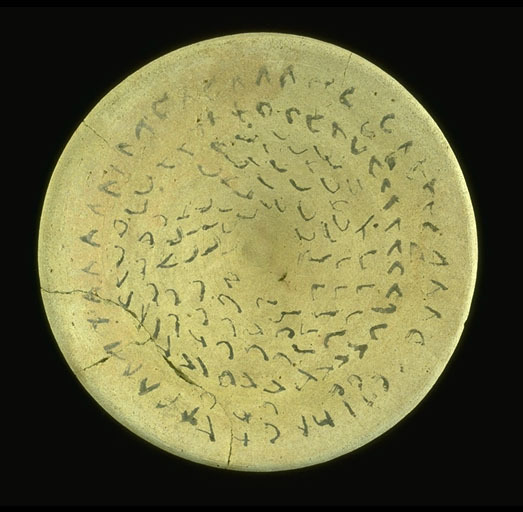 This bowl is "written" in a pseudo-script, clearly meant to imitate Syriac (an Aramaic dialect and alphabet, used on many demon-bowls). 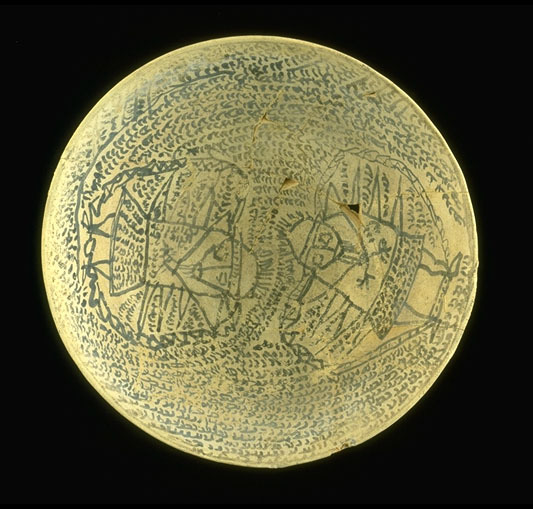 The text is written in Mandaic, an Eastern Aramaic dialect and script, in three wedge-shaped panels, each panel beginning on the bowl's rim and moving inward. The text itself is a copy of a long spell which appears on several such bowls, and into which the client's name -- in this case Negray daughter of Denday -- was inserted in the proper places. It was meant as a counter-spell, to protect the client against all her enemies' curses, whatever they may have been. Bibl. : Unpublished. 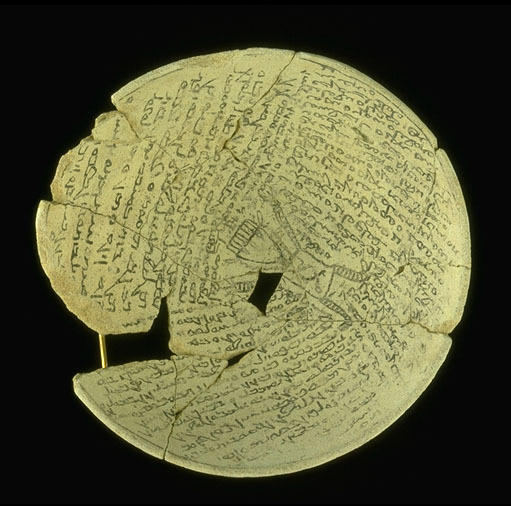 The translation and notes were provided by Timothy La Vallee, who is preparing these bowls for publication. Meaningless signs, or badly effaced Aramaic letters. 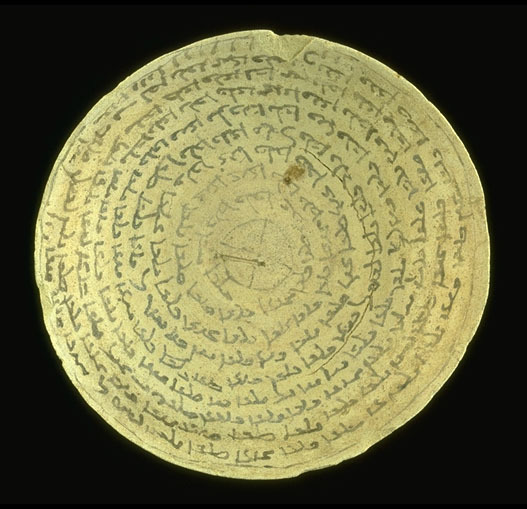 6th or 7th century, A.D. 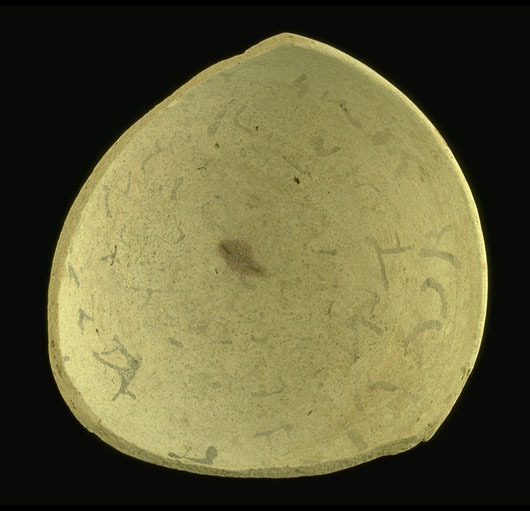 This bowl was found on top of another bowl (the excavation report does not specify which one), with an "inscribed" egg shell between them; unfortunately, the egg shell never made it to Ann Arbor. 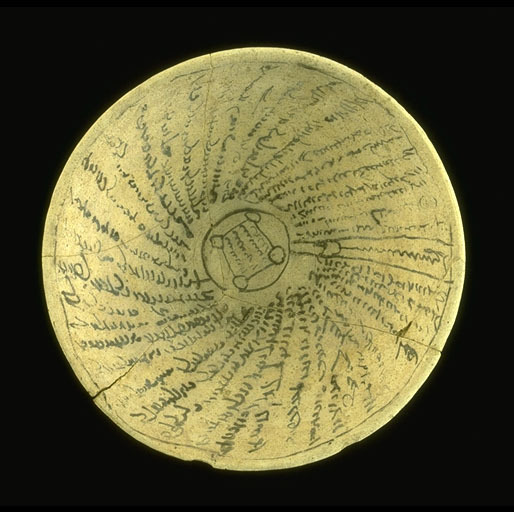 The "text" on the bowl is written in a pseudo-script, but the bowl's general appearance -- with the figures surrounded by a "text" (real or imaginary) -- is typical of the genre. Note the bound male demons -- their hands are tied, their feet are chained -- a clear sign of what the bowl itself was meant to achieve. Go on to Aggressive Magic.